Paladone distribute all kinds of quirky and fun gadgets, gifts and household products, and they have sent us their 12inch Grill Sergeant Portable Barbeque to review. I thought he'd just have a fancy paintjob, but it turns out he's a well-designed barbeque that works really effectively. Your Grill Sergeant arrives in a box and you have to assemble it yourself. You only need a screwdriver and a pair of pliers, and about 10 minutes. 25 minutes if you have a 6 year old assistant. 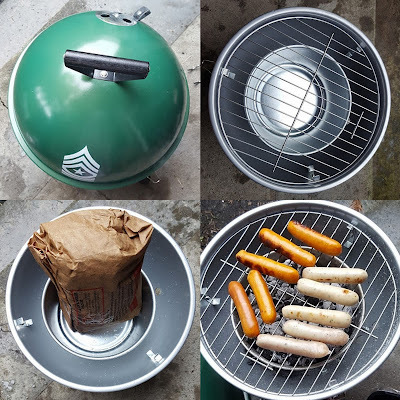 The Grill Sergeant has nice big air vents in the base and lid, that you can place opposite each other to create good airflow around your coals. There is a brilliant little coal bucket which sits inside the barbeque. It was tiny and we really weren't convinced it would cook very much, but 1 bucketfull actually cooked for as long as any full 'instant barbeque bag' usually does. 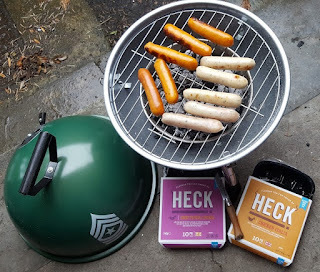 We only filled the bucket once, and cooked the veggie sausages followed by a load of Heck meat sausages - enough for 6 people. The height of the grill is perfect above the bucket. 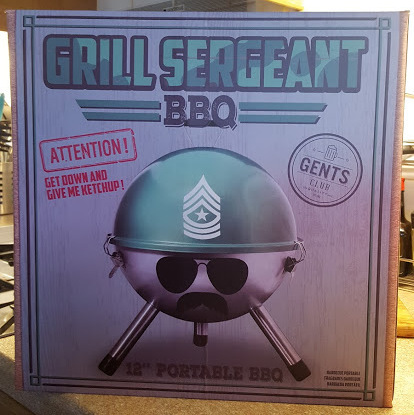 The Grill Sergeant is obviously not intended for a large family (sausages are small and we'd have struggled with fitting enough burgers or corncobs) and really is best for a lone diner, couple or group of 3. 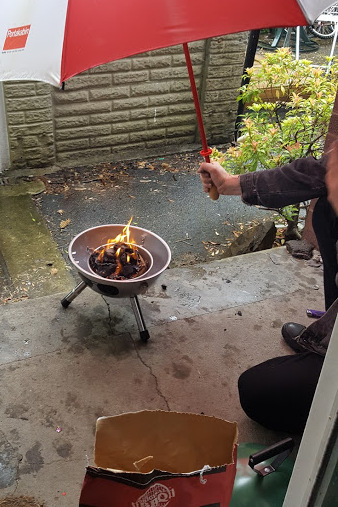 The coals stay inside that bucket, making it super easy to empty and clean. Also very handy. There are some lovely details. The rubber feet on the legs and snap tight fasteners to hold the lid work really well. 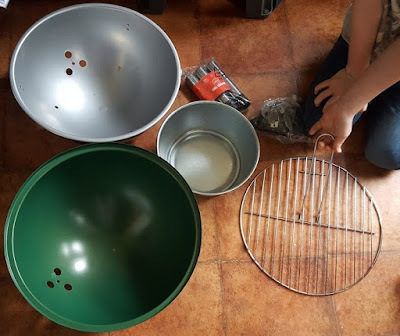 The wooden handle on top is solid and the Grill Sergeant itself is very sturdy with a nice thickness of metal without making it heavy. 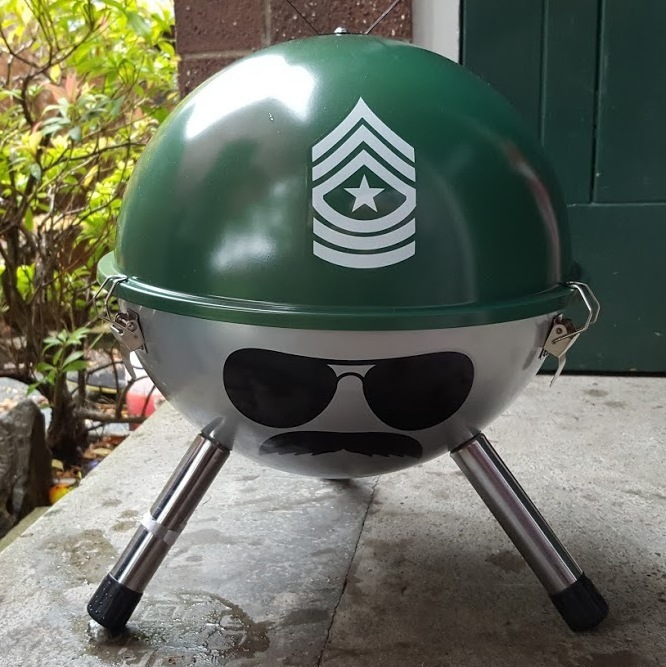 It's a bit more expensive than your standard barbeque, but it's got a moustache and sunglasses! This is THE perfect portable barbeque for festivals, or for a weekend away camping. It would make you very popular in a Halls Of Residence garden, and is ideal for when there are 2 or 3 of you sat out enjoying the sunshine in the garden. We were sent our Paladone Grill Sergeant Barbeque and the sausages for review. Rain is Manchester's own.